The famous flowering Laburnum Arch at Bodnant Garden, confused by our unpredictable weather is keeping local gardeners guessing. A warm spell in March allowed many plants to put on a flush of growth. Thinking that summer had arrived, the Laburnum Arch first looked as though it would flower weeks early, but has since gone back into hiding after the UK’s coolest April in 23 years. 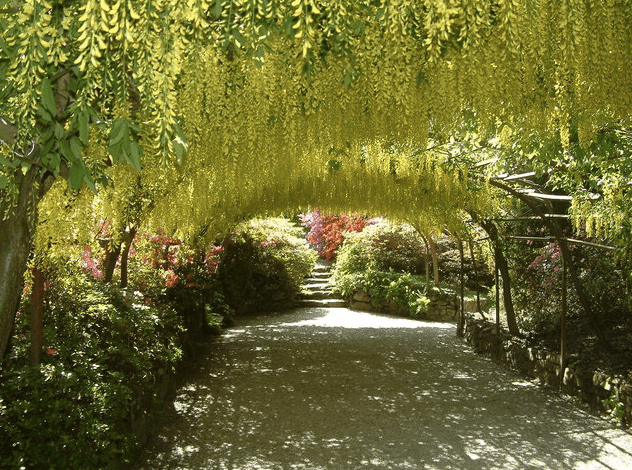 The large, dangling yellow flowers of the Laburnum trees cover a 180 foot long archway in the Garden, creating a spectacular walkway of colour and dappled light. Head Gardener Troy Scott Smith said: “A few weeks ago we were expecting the Arch to flower early, and the first flower spikes had started forming even as early as the end of March. But the recent cooler weather means it’s slowed right down. We’re now expecting it to flower at its normal time of around the 26th May, but if the weather warms up suddenly it will really race into life”. Luckily the unpredictable weather should not affect the quality or quantity of the flowers and visitors can expect a stunning display as ever when it does arrive. Bodnant Garden is one of the most beautiful gardens in the UK, spanning 80 acres situated above the River Conwy and looking across the valley towards the Snowdonia range. It is noted for its botanical collections and 180-foot long Laburnum Arch which flowers in late May and is holder of 4 National Collections – Embothriums, Magnolias, Camellias and Rhododendrons.